Building on the success of the K Series, the KW Series represents the next evolutionary step in wood enclosure loudspeakers. QSC system engineers have created the KW Series to feature all the groundbreaking electronic attributes of our popular K Series while at the same time designing a product that is both smaller and significantly lighter than previous wood enclosure models. High Output: Like K Series, each of the four KW Series models features a QSC designed, 1000 watt (2 x 500 W continuous) Class D power module. And continuing in the K Series tradition, every model is fitted with the identical high-output 1.75″ HF device (full-range models) and woofers of the same high quality design, regardless of speaker size. Defined Coverage Area: Directivity Matched Transition (DMT™) provides for matched LF and HF coverage across the entire listening area, eliminating unnatural “dead” or “hot” frequency zones. Connectivity: KW Series features a four-position mic / line gain switch that allows for connection of a wide variety of devices. Combo XLR and 1/4″ TRS inputs accept both mic and line level input while a set of RCA phono inputs (except KW181) allow additional connectivity to portable MP3 players, CD players and line-level mixers. Up to three audio sources can be mixed internally and summed to a balanced output for “daisy-chaining” of multiple units. Separate direct outputs are also provided on each channel for additional output flexibility. Tilt-Direct™: The KW122 and KW152 feature a unique Tilt-Direct™ pole cup mounting system. 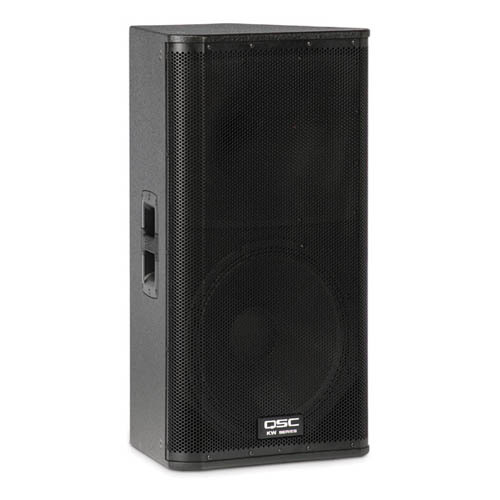 A simple turn of the dial engages a 7.5 degree downward tilt of the speaker allowing acoustic energy to be kept on the audience and off reflective surfaces for applications where maximum coverage from a high-positioned speaker is desired. Remote Gain: Remote gain control capability is offered via a potentiometer (not included) connected to the on-board Phoenix-Style connector. In an installed application, multiple KW Series speakers can be “daisy-chained” for total gain control from a single remote pot. Auto-standby mode is engaged after 5 minutes of inactivity. Premium-grade materials: KW Series is designed to withstand the rigors of professional use. Advanced construction processes, premium-grade Baltic birch cabinetry, ergonomic, cast aluminum handles, low-noise casters (KW181) and a highly protective steel grille provide for ease of transport and long term durability. Integrated M10 suspension points allow for flown applications with a KW M10 KIT (sold separately) and a threaded pole receptacle (KW181) provides for a positive, wobble free connection to a threaded speaker pole (included).